It’s a calm clear weekday in January. There’s a single buzzard soaring above, two squirrels scurrying in the trees and a pileated woodpecker calling in the distance. It’s hard to imagine this site was the capital of civilization in North Florida some 1200 or more years ago. The visible exception is the weathered remnant of “The Great Mound”, a massive earthen mound forty-six feet high and over 300 feet wide at its base. This is the largest Native American ceremonial mound in Florida, containing millions of twenty pound baskets of earth. Archeological sampling shows the builders mixed different types of earth to create a more stable structure. The mound’s persistence confirms the builders’ wisdom. Artifacts show the site was occupied up to 12, 000 years ago, long before the mound was built. The mound’s builders are believed to have been members of the late Swift Creek (200-450 A.D.) and early to middle Weeden Island cultures, a group of Native Americans who lived in North Florida between 450 and 900 A.D. Other authorities have suggested the mound was more of the style of later cultures, for example the Mississippians. Either way, these were relative new comers compared to the Paleoindians. Paleoindian tool marks were found on a mastodon tusk from the Aucilla River bottom and a stone point was found in the skull of a Bison antiquus raised from the Wacissa River bottom. Bison antiquus is believed to have disappeared around 10,000 years ago and the mastodon tusk was carbon dated as 12,000 years old. The Letchworth-Love Mounds archeological site in western Jefferson County preserves Mound 1, as it’s called in documents. Discovered in 1932, but officially unrecorded until 1975, the mound is surrounded by over twenty mounds outside the park in the area on the shore of Lake Miccosukee. 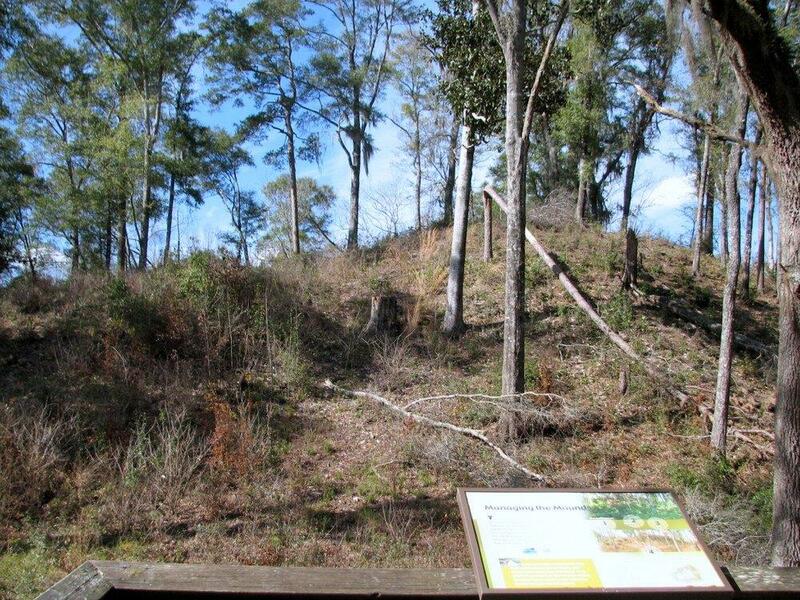 The Lake Jackson Mounds Archeological State Park north of Tallahassee is believed to be a later, separate settlement. At the height of its functions, the immediate Great Mound complex had 10 smaller mounds and two plazas. The Mound itself had two side platforms, an earthen ramp and a peak styled similar to Meso-American structures. The main village was to the south of the complex near Lloyd Creek. Other high ground near water in the county hold evidence of at least temporary camps and towns. Now the capital of Florida civilization is 30 miles west in another skyscraper, and the chiefs are debating ownership of the artifacts from the oldest capital. Wouldn’t this be a good time to learn more about our history? The park is located on South Sun Ray Road off US 90 and is open from sunrise to sunset. Don’t expect a crowd. The best time to plant a tree is twenty years ago. The second best time is for Arbor Day. Florida recognizes the event on the third Friday in January, but planting any time before spring will establish a tree quickly. Arbor Day is an annual observance that celebrates the role of trees in our lives and promotes tree planting and care. As a formal holiday, it was first observed on April 10, 1872 in the state of Nebraska. Today, every state and many countries join in the recognition of trees impact on people and the environment. Trees are the longest living organisms on the planet and one of the earth’s greatest natural resources. They keep our air supply clean, reduce noise pollution, improve water quality, help prevent erosion, provide food and building materials, create shade, and help make our landscapes look beautiful. A single tree produces approximately 260 pounds of oxygen per year. 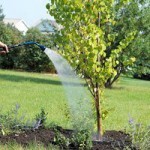 That means two mature trees can supply enough oxygen annually to support a family of four. The idea for Arbor Day in the U.S. began with Julius Sterling Morton. In 1854 he moved from Detroit to the area that is now the state of Nebraska. J. Sterling Morton was a journalist and nature lover who noticed that there were virtually no trees in Nebraska. He wrote and spoke about environmental stewardship and encouraged everyone to plant trees. Morton emphasized that trees were needed to act as windbreaks, to stabilize the soil, to provide shade, as well as, fuel and building materials for the early pioneers to prosper in the developing state. In 1872, The State Board of Agriculture accepted a resolution by J. Sterling Morton “to set aside one day to plant trees, both forest and fruit.” On April 10, 1872 one million trees were planted in Nebraska in honor of the first Arbor Day. Shortly after the 1872 observance, several other states passed legislation to observe Arbor Day. By 1920, 45 states and territories celebrated Arbor Day. 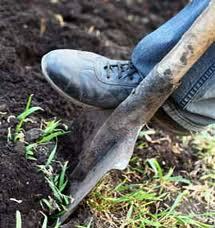 Richard Nixon proclaimed the last Friday in April as National Arbor Day during his presidency in 1970. Today, all 50 states in the U.S. have official Arbor Day, usually at a time of year that has the correct climatological conditions for planting trees. For Florida, the ideal tree planting time is January, so Florida’s Arbor Day is celebrated on the third Friday of the month. Similar events are observed throughout the world. In Israel it is the Tu B Shevat (New Year for Trees). Germany has Tag des Baumes . Japan and Korea celebrate an entire week in April. Even, Iceland one of the treeless countries in the world observes Student’s Afforestation Day. The trees planted on Arbor Day show a concern for future generations. The simple act of planting a tree represents a belief that the tree will grow and some day provide wood products, wildlife habitat erosion control, shelter from wind and sun, beauty, and inspiration for ourselves and our children. More and more visitors to the Gulf coast are seeking nature encounters when on vacation. Of course there are still the amusement park fans but there is an increasing number interested in visiting “The Real Florida” that our state park system promotes. Actually, I have found that many lifelong residents of the Florida panhandle have not visited many of the scenic natural areas of our state. 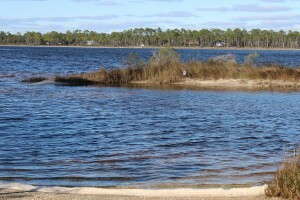 Looking from the kayak launch at Johnson’s Beach you can see across the ICW to Big Lagoon State Park. This body of water has seagrass and salt marshes along 12 miles of natural shoreline ending at an old fortification that can only be accessed by boat. There is plenty of snorkeling, birding, and fishing to do along the way. 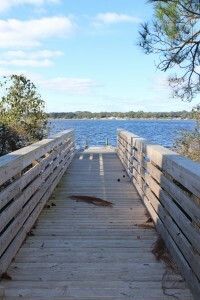 At the kayak launch at Johnson’s Beach is a short trail through the dunes of Perdido Key. You will be able to view a variety of plants and birds, or maybe, as I did, find a large coachwhip basking on a dune. There is no doubt that to conserve something you need to love it… and to love it you need to experience it. We think if you visit some of our natural areas you will fall in love with the area and hopefully we can conserve much of it. Nature-based tourism is a way to support the local economy but we need natural areas for this to happen… fishing is not much fun without fish. 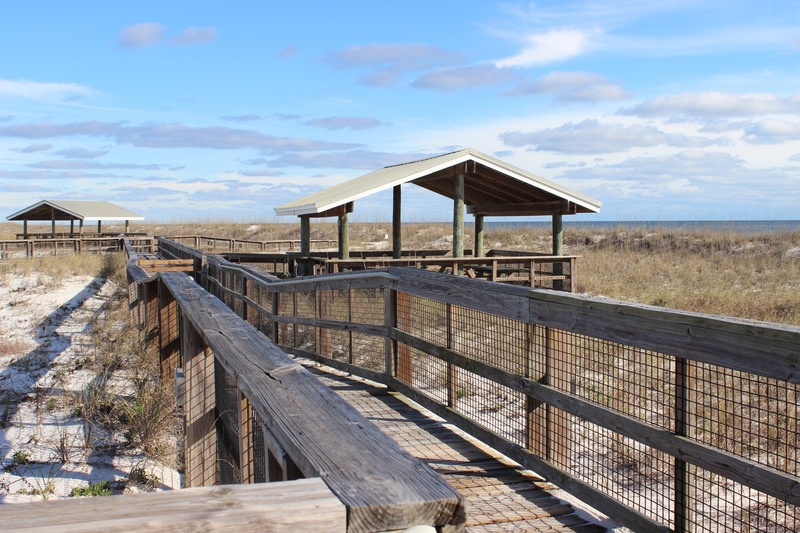 So we are going to begin a series of posts highlighting some of the nature-based tourism locations that visitors and locals can enjoy throughout the panhandle – from dunes of the coast to the forest of “north-end”. To begin the series, we will follow the Intracoastal Waterway from the Alabama state line to the Aucilla River (basically the Florida Panhandle). We begin at the western tip… Perdido Key. But first let’s talk about the Intracoastal Waterway itself. 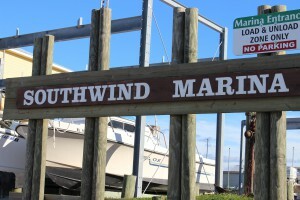 Southwind Marina is found on the northside of the ICW across from Perdido Key. For the visitor who is interested in fishing or diving the vessels can reach the Gulf in just a few minutes. Some dive charters will take you to spear lionfish. The concept of the Intracoastal Waterway (ICW) dates back to the 19th century but construction on the northern Gulf section began in 1925. The ICW begins in Brownsville TX along the U.S. coastline to Carrabelle, FL. From here you follow a series of markers across the open Gulf to Anclote Key (near Tampa) where again the inland ICW heads to Ft. Myers. There is a canal that cuts across to Lake Okeechobee, and the east coast of Florida, but many boaters take the Florida Keys route. If crossing the state through the lake you will arrive at Jupiter Inlet on the east coast the ICW which travels north from here to Virginia – a total of about 3000 miles. The waterway was developed to make commercial shipping safer. Plans to cut a canal across north Florida from the Crystal River to the St. Augustine area never happened. The ICW consists of manmade canals, protected lagoons and sounds, and open sections of local bays. In the Florida panhandle the ICW begins at the state line in Perdido Bay. It follows a narrow section of water north of what the locals call “Old River” between Ono Island AL and Innerarity Point FL. It eventually enters Big Lagoon in Escambia County before crossing the lower portion of Pensacola Bay. It is this portion of the ICW we will focus on in this article. Escambia County Division of Marine Resources has provided three inshore snorkel reefs for the visitor who would like to experience a reef diving but is not a certified diver. 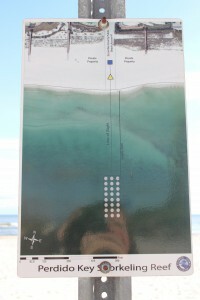 The reefs can be found by aligning the blue square and yellow triangle on the beach. This one is on Perdido Key near Johnson’s Beach. The yellow triangle used to locate the reef while you are swimming. These nearshore reefs have a variety of small reef fish and occasionally, in the warmer months, a sea turtle may visit. Perdido Key is a 15-mile-long barrier island stretching from the mouth of Perdido Bay to “Ft. McRae” near NAS Pensacola in the Gulf Islands National Seashore. The western end is actually in Alabama. The state line is near Ono Island and the famous Flora-Bama Bar. North of the Key is “Old River”, then Ono Island AL, then the ICW itself, and eventually Innerarity Point FL. For the nature tourist you have miles of white sandy beaches to the south which are great for shell collecting, birding, and fishing. In the summer the beach comber can find ghost crabs, flowers, and maybe a nesting sea turtle. The “river” side of the island has numerous small islets and seagrass beds that offer good birding, snorkeling, and fishing. Be aware though to stay out of the ICW here. It is very narrow and the passing barges are very large. Dive flags are required of snorkelers in Florida. There is a public kayak launch on the north side along “Old River”. 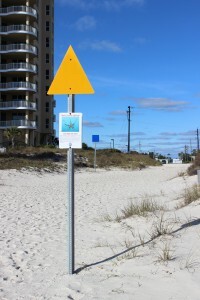 Perdido Key is home to the endangered Perdido Key Beach Mouse. Many locals have lived on the island all of their lives and have not seen one… maybe you will be lucky! As Perdido Key Drive heads north off of the Key you will find a small side road leading to Johnson’s Beach and a section of the Gulf Islands National Seashore. Just as you turn onto Johnson’s Beach Road you will find Sandy Key Road to the south. There is a public access point here and a public nearshore snorkel reef provided by Escambia County. These Gulf side reefs attract a variety of small reef fish, including many tropicals, as well as larger species such as sheepshead and snapper. Be sure to have your dive flag with you. 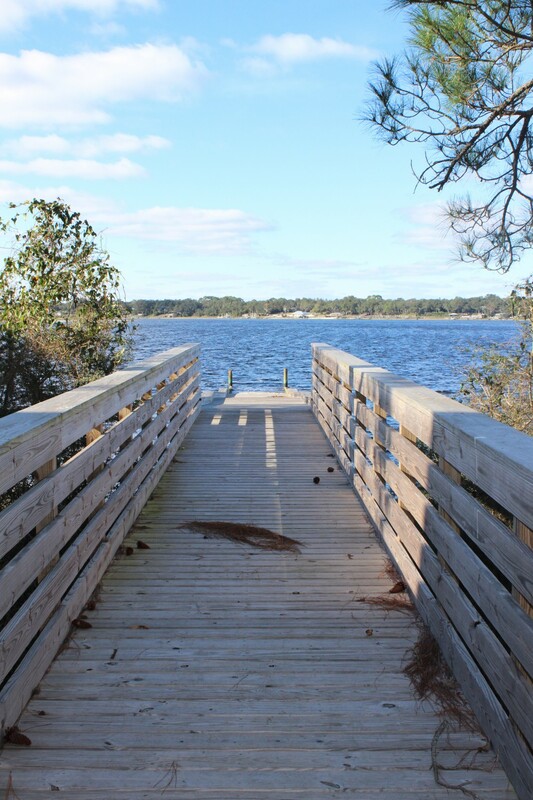 This public kayak ramp is found on the north side of Perdido Key. From here the paddler can visit several small islets and snorkel grassbeds. There’s good fishing too. The ICW is narrow here though so you need to be aware of large boat traffic. 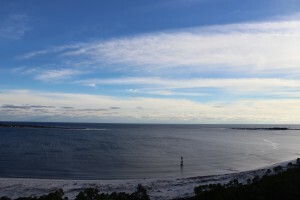 The last 12 miles of Perdido Key is part of the Gulf Islands National Seashore. The road only goes about 2 miles of that but you are allowed to hike the rest. The southern shore is more beautiful white beaches and the north is bordered by Big Lagoon. Big Lagoon is pretty shallow and outside the ICW host a lot of seagrass. Here you can snorkel for hours and see fish, crabs, and maybe a scallop or two (they are illegal to harvest here though). Many species of birds can be found here including osprey. 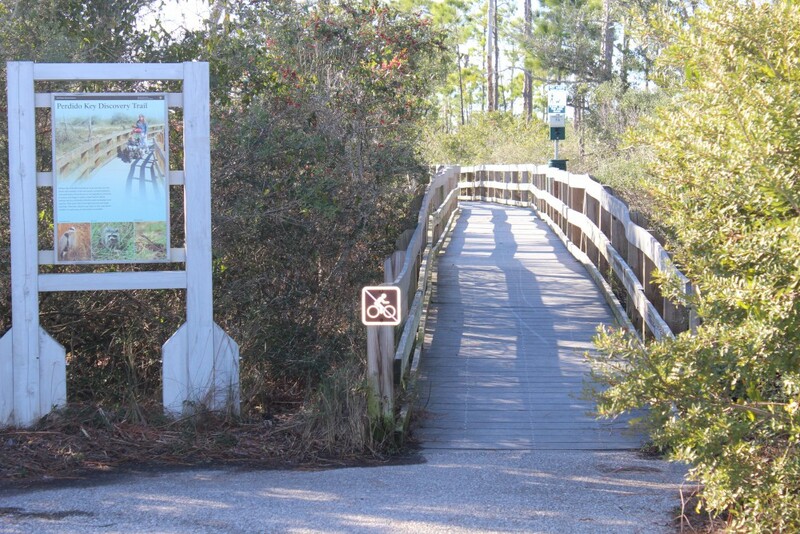 There is a short natural trail at the kayak launch on the lagoon side of the park where you can see a variety of dune plants, animal tracks (such as deer), and other wildlife such as coachwhip snakes and the elusive diamondback terrapin. 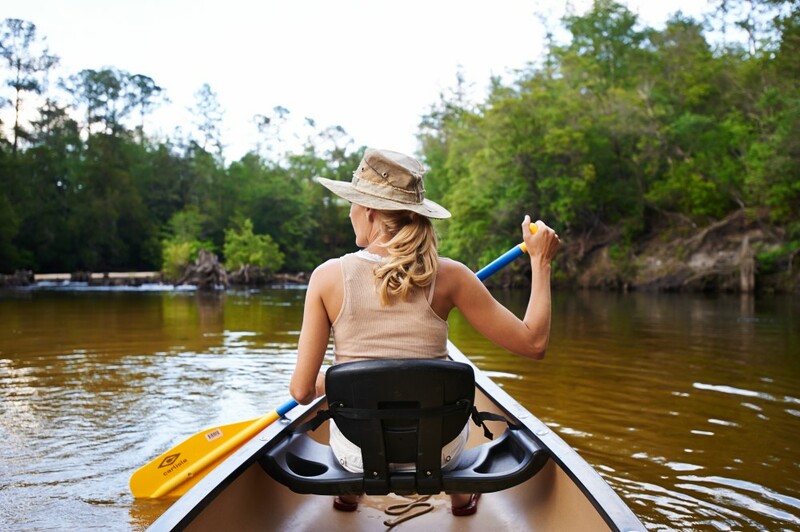 You can paddle from the kayak launch 12 miles to the east point and “Ft. McRae”. Seagrasses, salt marshes, dunes, freshwater ponds, and assorted wildlife can be found here. Back Country Camping is allowed in this portion of the Seashore but you must register at the Ranger station. As you leave Perdido Key you find Big Lagoon State Park on your right. Located on north shore of Big Lagoon you will find the ICW. This park provides camping, hiking, snorkeling, birding, and kayak rentals. The park has hiking trails and freshwater ponds that harbor a variety of wildlife including species of freshwater turtles. 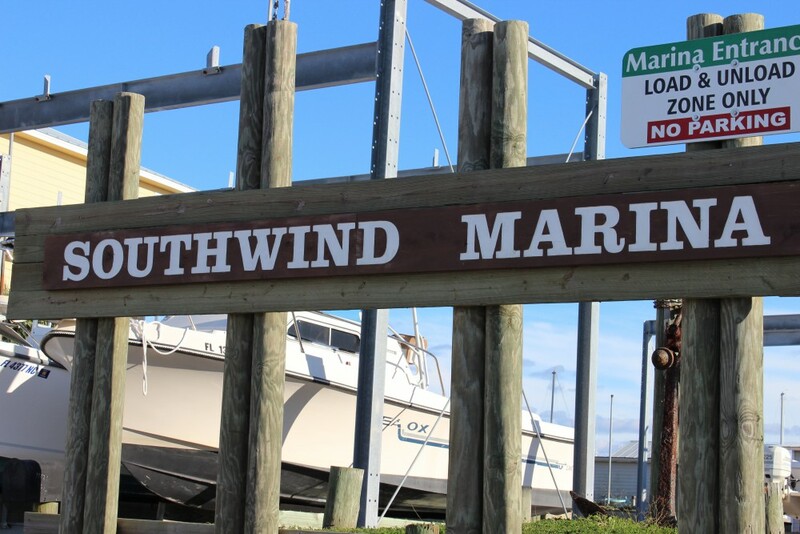 Just down Gulf Beach Highway you will find Southwind Marina, which is home to many charter boats. Also located on Big Lagoon these charters have quick access to offshore reefs in the Gulf of Mexico for those interested in diving and fishing, including trips to hunt the invasive lionfish. 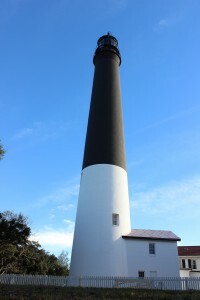 The 150′ Pensacola Lighthouse was first lit in 1859. The distinctive colors made it easy for mariners to identify from offshore and the light signal (time between flashes) is 21 seconds. This is a must see for those visiting the Perdido Key area. 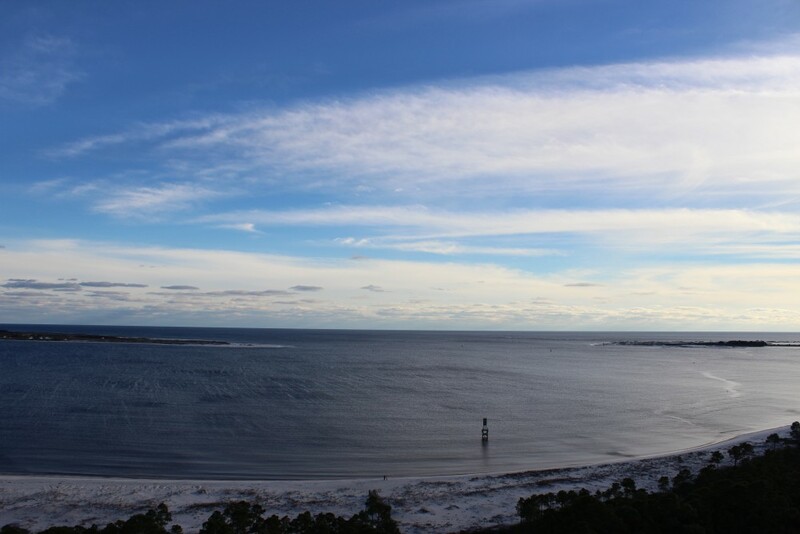 From the Pensacola Lighthouse you get a great view of the open Gulf and the eastern end of Perdido Key. Here the pass separates Perdido Key (on the right) and Santa Rosa Island. Before you leave the Perdido Key area and head for Pensacola Beach the nature tourist should make a stop at NAS Pensacola. The 150 foot Pensacola Lighthouse is open to the public and the views of the ICW as well as the two barrier islands (Perdido Key and Santa Rosa Island) are wonderful. 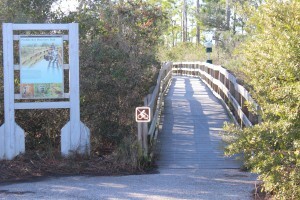 There is a nature trail aboard NAS called Trout Point which leads you from the main road to the ICW. Next stop… Santa Rosa Island. The Florida Legislature has just convened for the 2016 session, and news from the capitol is already announcing a sweeping water bill on the fast-track to passage. 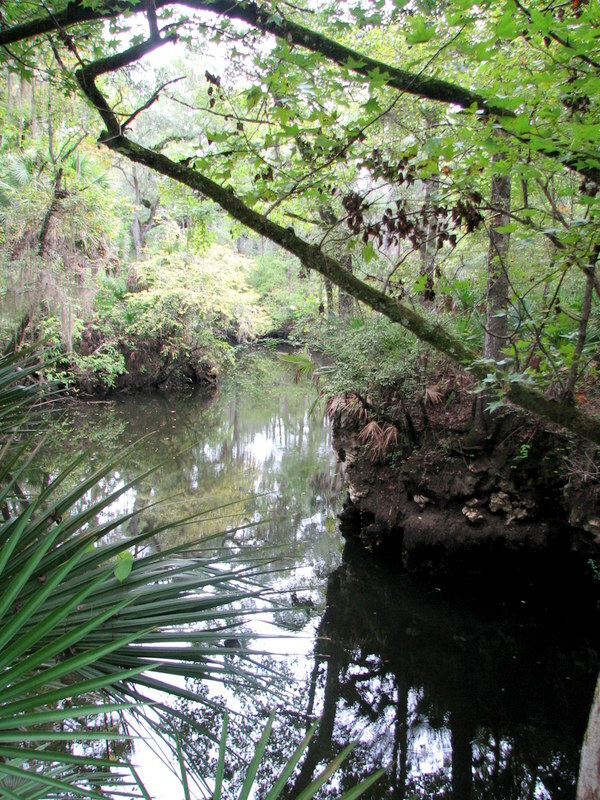 Supporters are quoted as saying it would provide increased protection for certain key water resources in the State such as springs and the Everglades; opponents are quoted as saying that while it doesn’t undo current protections, neither does it go far enough to assure sustainable protection of water resources for Florida’s future. Thus it seems our legislators and lobbyists are celebrating something that’s a little better than what we’ve got now, but isn’t good enough to get the job done. That doesn’t sound very reassuring. We need a realistic blueprint for how Florida’s ever-expanding population and robust agricultural industry that produces our food can continue to use Florida’s water resources without using them up. The only way that’s going to happen is for citizens concerned about their grandchildren’s future in Florida to become the voices that legislators ignore at the peril of their political future. So how do you know what to think, and what to say, about the state of water resources where you live – in the Panhandle? Do you understand their current status and vulnerabilities? Threats to their near-term viability? Prospects for their long-term sustainability, complicated as they are by projections of amplified climate variability? “Panhandle Outdoors LIVE!” is stepping it up a notch for 2016, to help you get a handle on these “need to know” issues that affect future sustainability. University of Florida Extension’s acclaimed “Panhandle Outdoors LIVE!” mode of exploring signature water resources with knowledgeable guides is not going away; it’s being expanded into “water school” events in 2016. We are adding expert presentations and discussion to the on-water, on-trail immersion learning adventures you’ve come to love. 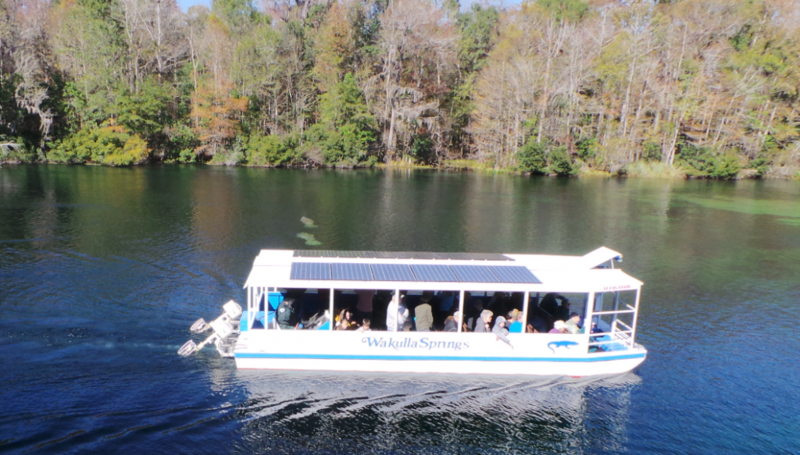 Daily river cruises on the Wakulla River are a great way to see manatees and other unique wildlife. 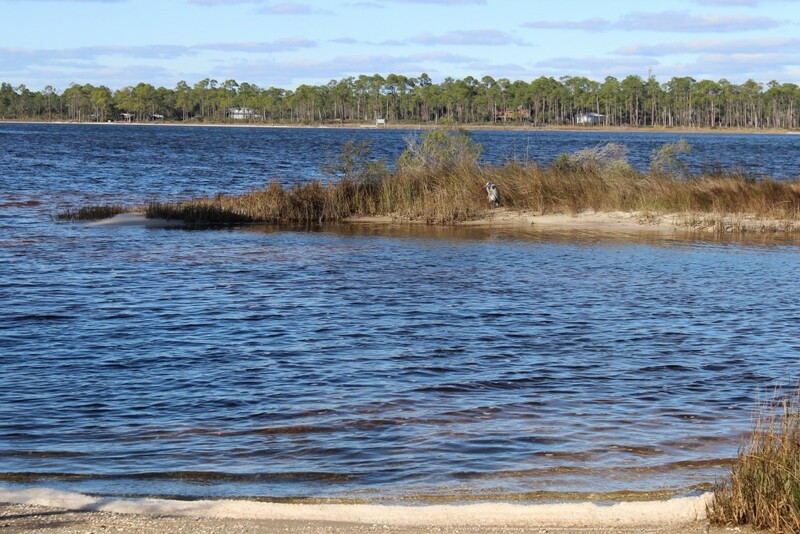 This year we’ll study four Panhandle water resources of regional significance – the Wakulla Springshed, St. Joe Bay, the Econfina Watershed, and Weeks Bay. Two are freshwater streams and their watersheds; two are bays. Two are in the eastern Panhandle; two are in the west (one even in Alabama). Two are being offered in the spring, the other two in the fall. First up is the Panhandle Outdoors LIVE! – Wakulla Springshed School on March 1-2. 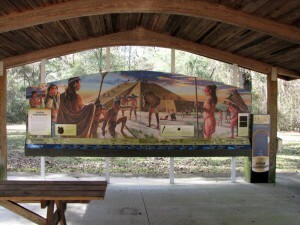 It will base out of the magnificent “Old Florida” Wakulla Springs Lodge south of Tallahassee, and feature field trips to Leon Sinks Geological Area, Cherokee Sink and the Wakulla River – concluding with an optional paddle downriver from Wakulla Springs through a transition of ecosystems to historic Fort San Marcos de Apalachee, where the Wakulla joins the St. Marks River. Next up, on April 4-5, is Panhandle Outdoors LIVE! – Weeks Bay Watershed School that will base out of the Episcopal Beckwith Camp and Retreat Center on Weeks Bay in Fairhope (Baldwin County) Alabama. This second watershed school will focus on the Weeks Bay National Estuarine Research Reserve, and feature a demonstration of oyster farming and a kayak paddle trip. 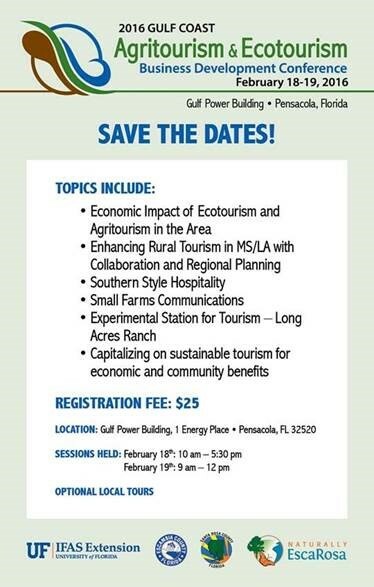 In 2014, five Extension agents involved with www.naturallyescarosa.com launched the first Gulf Coast Agritourism & Ecotourism Business Development Conference. Over sixty business owners and members of the hospitality industry met to discuss marketing, sustainable tourism, and how to handle insurance and liability in an industry that involves outdoor exploration. Back by popular demand, we have organized a second one to be held February 18-19 at the Gulf Power Building in Pensacola. We have a dynamic group of speakers from all over the southeast to discuss the economic opportunities available in this line of work. Due to partial grant funding, registration (includes meals and materials) is only $25!!! Anyone involved in the agriculture (U-pick operations, fresh produce markets, corn mazes, pumpkin patches, etc. ), nature (paddling, camping, fishing, etc.) tourism or hospitality industry is encouraged to come. Click Here and Buy Tickets today!